I just got these along with a few N284s and some other items at an antique shop. Does anyone know who made the 1946 one? Is it a fantasy item (made more recently)? When I searched online I saw one sold in a Heritage auction in 2010. Last edited by batsballsbases; 04-20-2016 at 11:57 AM. No, the pin is not a fantasy, it is the real deal. Commissioned by a wishful thinking vendor. I wish I could find stuff like that at antique shops. Then again, I guess I would actually have to go to antique shops. VERY nice, Dave! That one of Matty is special. James Toney v. Roy Jones Jr.
--I also have several Peter Max designed pins from the movie Paint Your Wagon. would anyone really walk around with this kind of weight hanging off a PM-10? How about the ones with a 6" bowie knife attached? Often wondered the same... Those Pinbacks with knives attached are from a whole different era. I believe the attachments to pinbacks were done to make them more attractive to kids, especially boys. I remember vendors at ballparks with boards filled with pins with attachments. I admit as a 10 year old boy, a pin with a knife attached was pretty neat. Now of course this would never be allowed. Of course when I went to high school we had a rifle club where the boys brought their firearms to school. I don't know about the rest of you, but part of the reason I collect is to remember the good old days. They are sadly gone forever. Last edited by MK; 02-26-2014 at 04:22 PM. Comon Guys what red blooded american boy can resist the Mick with a neat little brother pig sticker!! Last edited by batsballsbases; 09-11-2014 at 11:21 AM. Generally, I don't love the attachments but the glove w/NY Giants was the only reason I got this duplicate Antonelli. Until today, I never saw a pinback with a knife attached. Very nice Mantle pin, BTW. 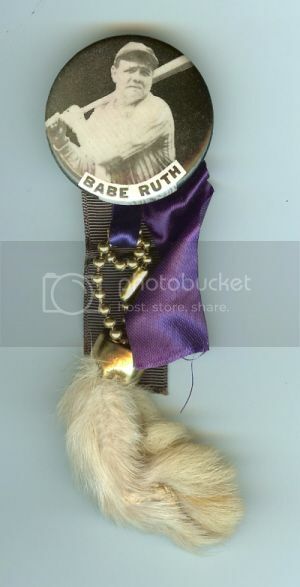 Another attachment I think is odd because it has nothing to do with baseball is this rabbits foot hanging from a Babe Ruth pinback. I think these were made in the 1940's and my imagination conjures up the theory that once the public knew he had cancer, these were made as a way for fans to "wish him luck". On the other hand, the black and purple ribbon lead me to think these were sold soon after his death, in which case, my first theory doesn't make sense I also have one with red and blue ribbons, also with a rabbits foot. BTW, I've been hoping to see some World Series and All-Star game press pins in this thread. I had a bunch of them years ago, but the vintage ones are gone now :-(. I have a few recent Yankees WS and 2008 All-Star and just one or two others. One of these days I hope to start a run of Yankees WS press pins. I'm sure many of you guys have nice press pins collections. I would love to see some of them! Another attachment I think is odd because it has nothing to do with baseball is this rabbits foot hanging from a Babe Ruth pinback. I have Giants pins with rabbit's feet.....I always figured they were just good luck for the team or player. Jack I agree my ruth pin is also just like yours rabbits foot and purple ribbons. always found it odd and I agree that they were probably trying to give him luck in his fight of cancer. Believe it or not that knife is very sharp and pretty well made. A kid using it in the wrong way could cause alot of damage with it! Rob - I was just sayin' that I would like to re-start my collection of Yankees press pins. But I'm not prejudiced - I want to see 'em all too! Good lord! If that was the SF logo, I'd be on it like a fly on you-now-what! Here are some good 1958-59 pinbacks. All are 3.5". Notice Willie's hat logo is that of the SF Seals. It is believed the little mitt is covering "1958" so that those buttons could be sold again the next year. I don't really collect pins although I have a number of them I picked up at ballparks as a kid. I had been looking for these two on eBay for quite some time. I had always wanted examples of both to display with my 1971 post season press passes and ticket stubs. Just when I had about given up they both were listed within weeks of each other. I have no idea why I had such difficulty finding these. Does anyone know if they made a larger version of World series pin? For the record, the Vida Blue pinback is from 1971, sold outside the stadium. These pins were unlicensed by MLB or MLBPA, and there are no manufacturer's marking whatsoever on the pins. I collect them, but they're tough to find! I found a reference to a set of 10 Brewers pins from this set today, posted by Mears. Just picked this up for a decent price on ebay. Dr. Paul thinks it's from 1951. Paul....if you see this.....I have no reason to suspect this is a re-pop but it is a bit chipped, as if there's no cello. Are yours the same? also looking for 1967 cranes pin athletics? does it exist? I wish I could answer your questions but I have no idea. I would absolutely LOVE to see a picture of your Armour team pins! Great information to know! I wonder if they were the work of ONE photographer or of a "team"? Vida Blue is off the want list! Vida Blue is now off of my no-hit pitcher pinback want list! Last edited by Scott Garner; 04-30-2014 at 04:25 PM. Pin Collection - focused on a few players and events. I just got the pins scanned below at a local antique shop. I am still trying to sort out which ones I want to keep. After viewing all of the pins in this thread I thought I would pick up a few for myself. However, I have decided to start very small and narrow my focus to players I liked in my childhood. I will be limiting my pickups to pins in this set as I think it is attractive and VERY CHEAP. However, I know nothing about these items. I picked up the pin below very recently and thought I should attempt to educate myself before I go further. Sorry to revive an old thread. •	Is there a name or designation for this set? •	How were they marketed? •	How many players from each team were produced? •	Are there any known scarcities or variations? •	The text on the Joe Morgan is different than the others is there a reason for that? •	What years were they produced? •	Are they all easel backed? Last edited by 71buc; 05-08-2014 at 12:09 AM. "sorry to revive an old thread"? I love that you revived it! I can't hang with those 5 figure card guys! I call them the "black square series" due to the text box. The Giants had 12 players but we hadn't seen McCovey until just recently. Based on the Giants in the set, I've always thought 1972-73. Mine are all easel backed. I'm not sure I knew other teams were in this series....I tend to live in my own little Giants world ...I've always liked these too and would love to see more! Sorry for my crappy picture. The Tom Bradley (lower right) isn't due to me....he is ALWAYS in heavy shadow. Last edited by ooo-ribay; 05-08-2014 at 03:49 PM. Thanks for the information, its the simple pleasures in life that are sometimes the most fun. Sanguillen arrived in the mail today. I agree based on Clemente that 72-73 would be the likely production dates. The other Pirates I'm aware of are Al Oliver, Bob Robertson, Gene Clines, and Rene Stennet. I have to believe Dock Ellis and Steve Blass were made as well. If so that would make 10 Bucs. just based on eBay, they don't turn up very often....altho one seller has had maybe 6 of the Giants forever. He's asking $20 ea. What have you been paying? Also, have you seen others besides Bucs, Reds and Giants? I paid $30 for Clemente $15 for Stargell the rest were $7-10 a piece. This seller has a variety of them from different teams. I dont know how he is dating them and his prices seem a bit high. a) the Orioles sure have a lot of nice looking pins. b) the Orioles sure have fallen but are hopefully on the way way back. Didn't see this one on your nohitter list...you must have it. Do you know what year and/or category it is? Here is a scan of the Tony Oliva and Harmon Killebrew buttons from this series. I don't have individual scans for them. I always thought they were from 1971-1973. I know there are two different Clemente buttons from this series. One of them is very difficult to find. I have found the Twins players from this series to be pretty difficult to find but not impossible. Some players are extremely easy and others you hardly ever see. I would guess 1972 for the dating. Joe Morgan came to the Reds from Houston to start the '72 Season, and the font on his pin is different/larger. That would indicate a revision of some type, and 1972 would make the most sense. If they were made in '71, Morgan would be an Astro. If they were made in '73, the Morgan Pin would look like all the rest of the Reds. That leaves 1972 as the logical choice. Just conjecture, but that's my measly contribution. Last edited by perezfan; 05-12-2014 at 12:36 PM. That's good logic. I am thinking they were made for 2 or 3 years though. My logic is based on the fact that Clemente has two different buttons from this series with completely different photos. Great thread and discussion! Lots of pins and lots of pennants for the Twins. I guess it only makes sense with Wincraft based in state. Your logic sounds good to me. However, I have never seen another with the same font as on the Morgan. Does anyone have an example of the other version of Clemente? I would love to see it. I do have two different Joe Horlen pinback buttons from his stint with the White Sox, but I have not see this one which is completely new to me. For many years I have owned this "black square" pinback of Nolan Ryan in my collection. This is a very challenging pin to find as I have not seen/ heard of many in the hobby, even amongst fellow Nolan Ryan advanced collectors. I always guessed its vintage to be around 1974, but I can certainly believe that it could be 1973 based on the road grey uniform style that Nolan is wearing. It cannot be from 1972 because of the "A" on Nolan's Angels jersey being a capital "A" and not the lower case "a" which were used in 1972. My Ryan pinback does not have an easel on the back, or at least mine did not have one when I purchased it second hand in the 1980's. Finally, this pinback was definitely photographed somewhere other than So Cal. Nolan is wearing a road grey uniform and features the shaded face ala Rob's Tom Bradley SF pinback. I don't recognize the stadium in the background. Does anyone recognize where this photo may have been shot? One of my close friends and I, which both attended many Angels games during the early to mid 1970's in Anaheim, do not recognize this pinback as one that was sold at Anaheim Stadium, so these likely were not a stadium pin. Last edited by Scott Garner; 05-14-2014 at 05:00 AM. Interesting that this one could not be 1972. The shaded face reinforces my idea that not a whole lot of effort went into production. The "centering" also often leaves something to be desired. Last edited by ooo-ribay; 08-09-2014 at 12:47 PM. Thanks for your input Scott. Why am I not surprised you would have the Ryan pin. Here are pins featuring Santo with the White Sox. He played for them in only 1974. The Cepeda pin has to be 1973 for the same reason. I am thinking these were produced between 1972 and 1974. Interesting... Based on evidence, it looks like these were definitely made over a range of 2-3 years.